SelfPromotion.com SelfPromotion.com is more than a free submission site. It's the net's leading resource for do-it-yourself Web Promotion. If you want a hands-on approach to site promotion, start here. 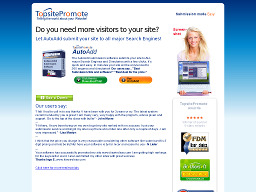 TopSitePromote Do you want more visitors to your website? Then the first thing to do is submitting your pages to all major Search Engines and Directories. That's what our service and software do for you. Our users say.. "Best Submission Site!" BuildWebsite4U.com A safe, quick, and free website submission service. It can help you submit your site to the major search engines and directories that account for about 95% of your traffic. 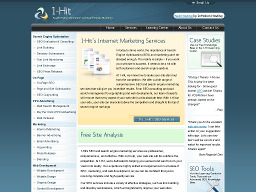 1-Hit.com Offers Search Engine Optimization, free and paid web site promotion services, web master tools and marketing information. 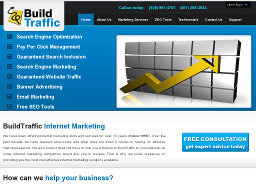 BuildTraffic.com BuildTraffic.com offers a wide range of paid and free web promotion tools including site submission service, site submission software, reduced rate banner advertising and more. Scrub the Web Easy Submit Submit to ten major search engines for free or buy a membership to submit as often as you like to 60 search engines. 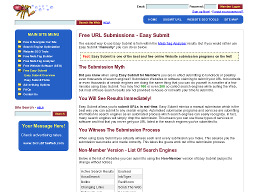 iNeedHits.com Use their Submit Free service to submit your site to 28 popular search engines with one easy form. INeedHits offers several submission packages of which Submit Free is just one. All in all, this is one of the Web's top submission services. 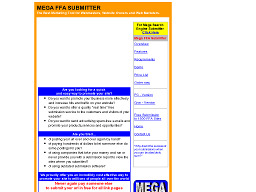 Mega Free Links and Search Engine Submission Scripts With the MEGA FFA SUBMITTER or MEGA SEARCH ENGINE SUBMITTER script your visitors can submit to Thousands of FFA sites and 60 plus search engines for Free. 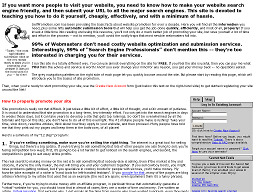 WEBalley - Web Announcer 2.0 Web Announcer lets you submit your web site to about 72 search engines in one go. 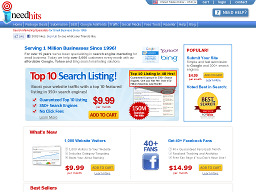 SearchEnginePeople.com SearchEnginePeople.com is a FREE resource for adding sites to 20 major search engines, and 200+ additional search engines. While you're there, check your link popularity, and the link popularity of your competitors! 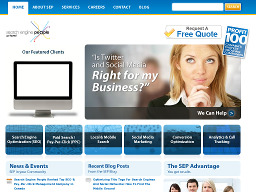 SearchEnginePeople.com also offers professional search enginepositioning services! 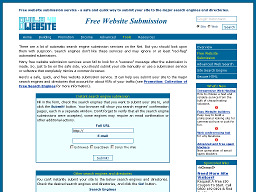 FreeWebSubmission.com One of the better free submission sites on the Web, providing a top 50 search engine list for manual submission and an auto-submitter for 20 engines. The site also offers excellent link popularity and site ranking tools. 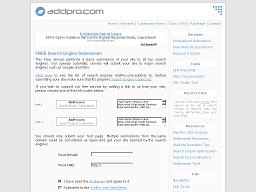 AddPro.com Register your site for free to 30+ top search engines. This automatic service will submit your site fast to major engines such as Google, Hotbot, Excite etc. TrafficZap.com FREE Search Engine Submitter, FREE Meta Tag Generator and FREE Link Popularity Checker. Plus tons of traffic building information.